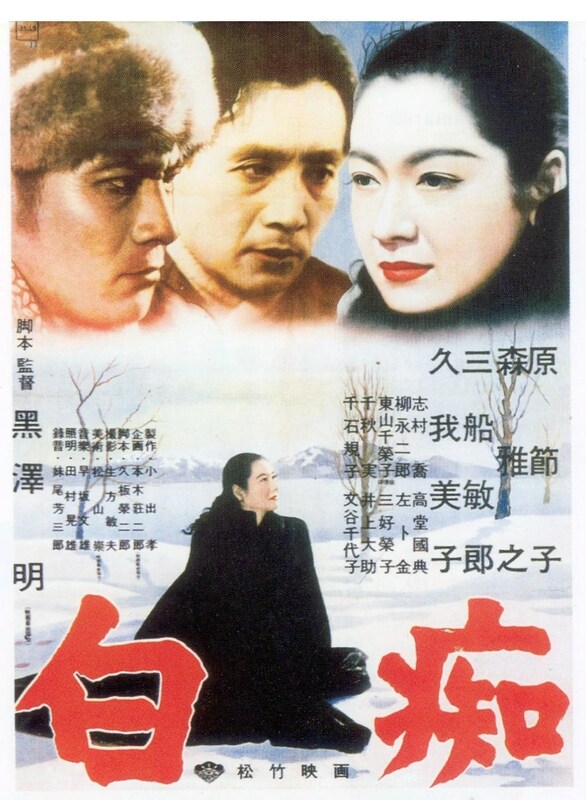 Dostoyevsky’s dark parable on human emotion is uprooted from its Russian Summer setting and manoeuvred to the cold, snowy straits of northern Japan in Akira Kurosawa’s bleak but majestic adaptation of The Idiot. Though not often mentioned when discussing Kurosawa’s work, The Idiot demonstrates Kurosawa’s cinematic skill arguably better than many of his well-known works such as Seven Samurai, Rashomonand Ran. Perhaps it’s the general lack of action compared to his more popular films that leave it rather overlooked but then again this film chimes well with his usual themes of exploration such as impossible decisions and honour above all else so isn’t necessarily out of character for Kurosawa. With The Idiot the common themes on show (which are also some of Dostoyevsky’s most interesting ideas) chime well with that of Yasujuro Ozu’s films yet Kurosowa’s extra level of bite gives the film’s overall tragedy far more weight than the likes of Tokyo Story or Late Autumn. What’s more odd when considering the almost obscure nature of the film is the well-documented feelings of its creator who readily admitted to spending more time on it than any of his other films. Watching the film for the first time, it’s clear that it’s a real labour of love for Kurosawa with each shot demonstrating an eye for detail, making it compositionally superior to many other filmmakers work. Snowy landscapes often make for beautiful filmmaking and yet only Welles can make snowy straits seem as beautiful as Kurosawa does. It can be seen as a wise move then to change the setting from summer in Russia to a crisp winter in Hokkaido. The narrative itself is icy to the touch with Masayuki Mori’s character cold yet innocent even with the charge of being a war criminal hanging over him. His crimes are never exposed in detail, perhaps playing a part in making the viewer feel sympathy for him. His wanderings around Hokkaido and being overly nice to the people he meets play a role in creating the situations the character later has to deal with. This paradox present in Dostoevsky’s initial character is painfully honed by Kurosawa’s direction and revealing the details of Kameda’s crimes would only diminish this contradiction. A criticism of the film could be about how haphazardly the narrative is shown. At times the story does feel like it’s so involved in itself that it’s forgotten to tell the viewer what exactly his going. On closer inspection though, the fault of this can squarely be put at the door of Shochiku Studios who famously cut the film down by 100 minutes. With this in mind then, it’s clear how much of a master director Kurosawa is for not only keeping the story together, but also making it an extremely moving and beautiful piece of cinema. Not all the praise can be given to the director though. In terms of Japanese stars, this film features an A list cast of some of the most talented performers in film history. Masayuki Mori brings Kameda to life in a way that goes against initial expectations. It’s impossible to think of his character being able to kill a fly never mind be guilty of war atrocities and this is down to Mori’s detailed and gentle performance that is easily on par with Takashi Shimura’s Kanji Watanabe from Kurosawa’s Ikiru. Setsuko Hara plays an initial femme fatal before turning into a jealous lover and emotional wreck who is, in the end, responsible for the stories tragic turn of events. Unlike her usual polite characters from such fables as Tokyo Story or Late Spring, her feisty side is endlessly watchable and there are touches of Lauren Bacall and Barbara Stanwyck in her performance. Even with the high quality of these two fine actors, neither can stand up to Toshiro Mifune’s Akama who is genuinely a nerve-wracking fiend to watch. Mifune often steals the limelight from his other film’s major players and The Idiot is no different. Whether it’s the cruel and taunting manner in which he talks to Taeko or the extremely believable insanity on show in the gripping finale, Mifune is the film’s best asset. His realisation (or initial lack of) of his final actions can be extremely disturbing and he shows a complete lack of understanding of the reality of life not seen again in cinema again until Hitchcock’s Norman Bates. The film’s score is also noteworthy. With its mix of Hermann like strings and traditional Japanese arrangements and instrumentation, Fumio Hayasaka’s score further adds to the extremely Hitchockian ending of the film itself. While perhaps not his most recognised work, Akira Kurosawa’s The Idiot is something of a hidden gem. While people more used to his fast paced samurai films like Yojimbo and Throne of Blood may find this rather slow, it’s a film of subtle beauty and its dark themes are never realised better in any of Kurosawa’s other work. Along with Ikiru, (filmed directly afterwards) The Idiot can be considered one of the greatest works to come out of Japan and is easily one Kurosawa’s best even with 100 minutes of the story missing.